Country Restrictions: BELGIUM, BULGARIA, CHINA, CUBA, CYPRUS, DENMARK, ESTONIA, DOMINICA, FRANCE, GREENLAND, GRENADA, HUNGARY, IRAN, IRAQ, ISRAEL, ITALY, PORTUGAL, SERBIA, ROMANIA, SINGAPORE, SPAIN, SUDAN, THE PHILIPPINES, THE NETHERLANDS, TURKEY, UK, USA. Assuming that basking in the sunshine and cavorting with the socialites in St. Tropez, a popular glitzy French Riviera mecca for the rich and famous, is not happening soon, here is an alternative. Take a needed break from the humdrum routine and enjoy the luxurious surroundings of the online Casino Tropez whenever you wish, without leaving home. 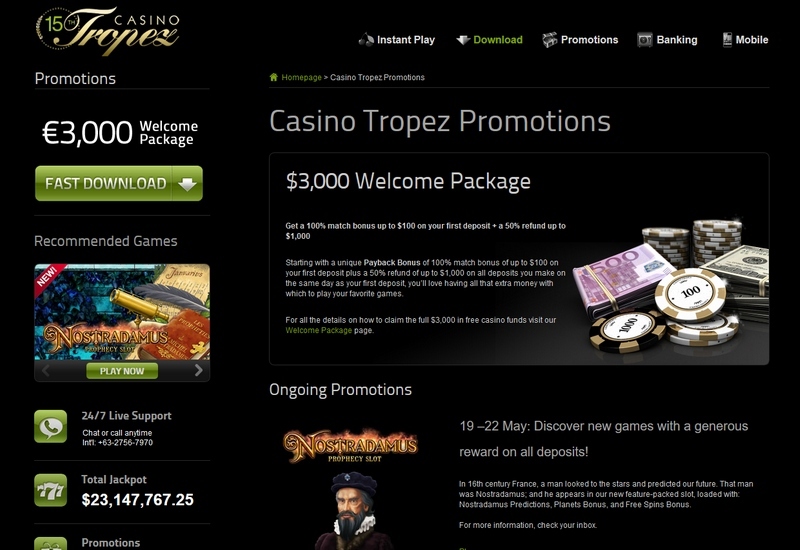 Casino Tropez is not a newcomer to the online casino market. The site has been operating successfully since 2001, attracting sophisticated gamblers from all over the globe with its generous Welcome Bonus, exciting interactive playing options, and wide variety of both slot machine games and table games - over 350 in all - where you can try your luck. So if you're a first time player, the casino's longevity is reassuring news. Casino Tropez is owned and managed by Imperial E-Club, Ltd., which also owns and operates (separately reviewed) Titan Casino, Vegas, Red, and Europa Casino. Like these other casinos, Casino Tropez is powered by Playtech, a firm you can trust for quality, safety, reliability, and fair gaming practices. The casino does not appear to be eCogra certified. However, it is licensed by the Antigua and Barbados Financial Services Regulatory Commission. The Commission has determined that the software meets internationally recognized standards for fairness and that the players are treated fairly as well. Technical Systems Testing has also reviewed the software and has given all of the games on this website a green light with regard to fairness. Casino Tropez promotes "Responsible Gambling." 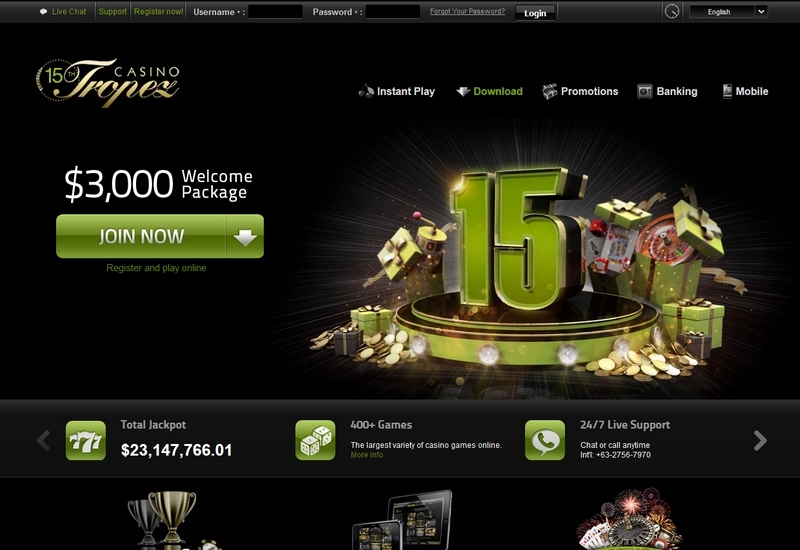 The casino software enables players to access and review their financial transaction records. In addition, minors are denied access and players who might have a gambling problem are provided with appropriate resources. The state-of-the-art software can be downloaded onto your computer in as little as two minutes. Or you can use the no-download flash version. You can also play the games on your mobile device. Unfortunately, at this time, U.S. residents are denied access. At this virtual gaming playground, you will never lack for something to do. With over 350 games available, there is something for everyone. If you are a slots player, along with traditional slot machine games of every variety, for a change of pace, you can try the Marvel-themed or progressive jackpot slots. If you are a table games player, don't pass up the opportunity to play blackjack, roulette, or baccarat with a live casino dealer. For those of you who want more action and feel adventurous, you can try different variations of blackjack and roulette. But, to maximize your chance at winning, make sure you understand the specific rules and playing strategy changes, if any, beforehand. If you prefer to play for free before going full speed ahead with real money, you can do so. When you are ready to fund your account, there are many fast and secure banking options to choose from. 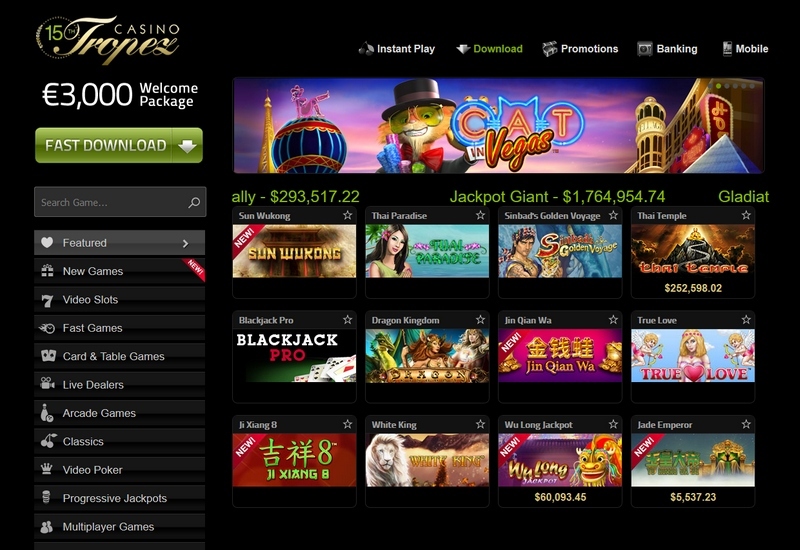 (See accompanying list and check with the casino directly for even more options, some of which may be country specific.) Some options are only available for deposit, not for withdrawal. If possible, try to use one of the casino banking methods which give you a small extra bonus on top of the regular new player welcome bonus. This casino has a good reputation for speedy withdrawals. In addition, 24 hour customer support is available when needed via live chat, phone, or email. The heavily promoted "$3,000 new player welcome bonus" sounds great, but, as you should already know, unless you are completely new to online casino play, there are stipulations. First, this figure is the maximum you can get (other than 15% extra for deposits over $400 or for using a preferred casino banking method). Secondly, to even be eligible for the maximum bonus, your opening deposit must be at least $100, your second deposit at least $400, and then you must make another $100 or greater deposit for 27 consecutive Sundays. Your first deposit is matched 100% (up to $100), your second is matched 50% (up to $200), and the Sunday deposits, like the opening deposit, are also each matched 100% (up to $100). Lastly, in each case, prior to withdrawal, you must meet the designated play through requirements (deposit and bonus combined). While slot play counts 100%, other games count less. See the casino rules for more information. Each time you play, you are awarded loyalty points. Slot play is rewarded at the fastest rate, 1 comp point for each $9 wagered. Video Poker, blackjack, and roulette all have higher betting requirements. For example, roulette play earns you 1 point for each $20 wagered, while blackjack with surrender takes $30 to get 1 point. As your points accumulate, they can be exchanged for credits to your account. Meanwhile your overall level of play determines your standing in the 7-tiered Club Tropez. The higher your tier, the more special rewards and privileges you receive. If your first day of play isn't going well, and you not only lose your entire opening deposit, but more money you deposit after that, Casino Tropez will give you back 50% (up to $1,000) of the additional money you deposited and lost. On a lighter note, the casino's Bonus Beach remains open for the duration of the summer. Look for the hidden game of the day to win a special bonus prize. However, these bonuses expire after 24 hours and, you guessed it, have play through requirements for withdrawal.